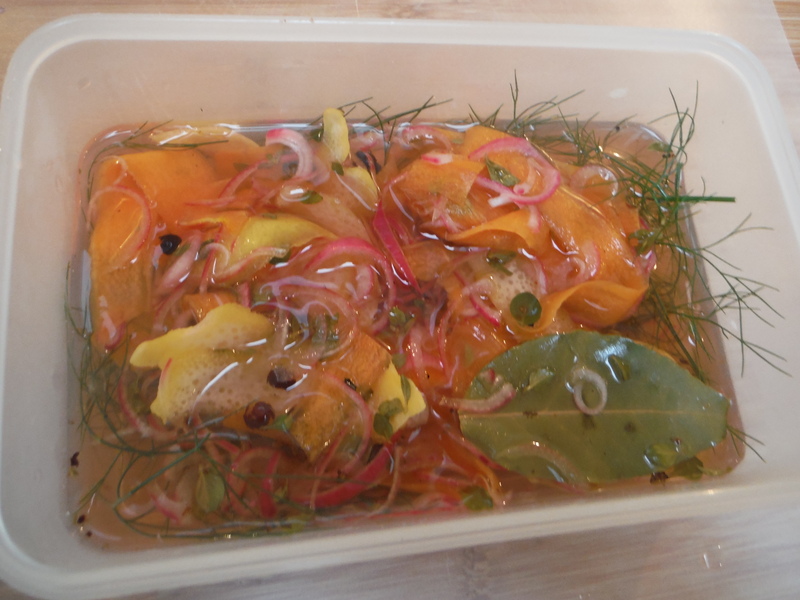 Soused herring: lightly pickled, delicately flavoured and easy to make. But, other ways of preserving herring were also popular and the best of these is known as ‘sousing’. Sousing is a traditional technique that often involves pickling gently cooked fish, but in the case of this recipe pickles the fish raw. The resulting fish is firm and mild, with the vinegar of the pickle cuttting through the natural fattiness of the fish. If your herring comes with head on and uncleaned then you’ll need to prepare it. First cut the stomach and remove the guts. 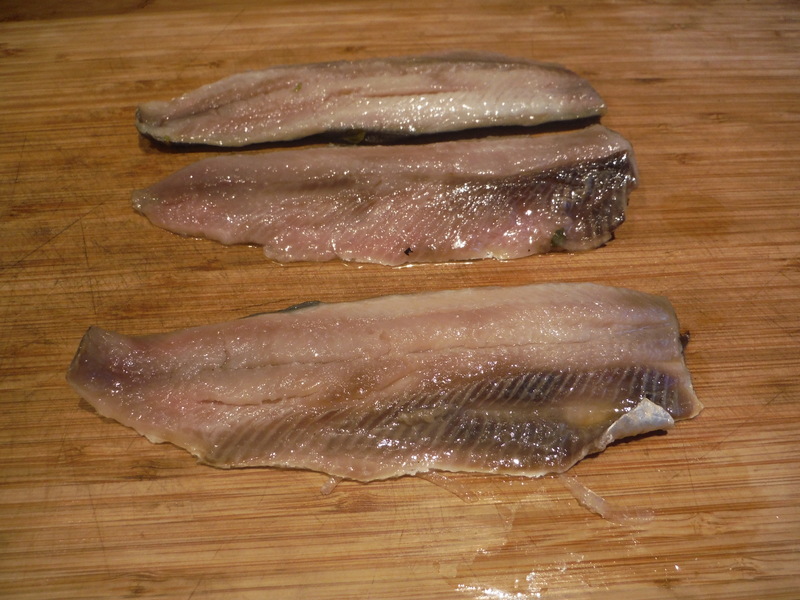 Then fillet the herring to remove the bones and leave two clean fillets for each fish. Sprinkle salt over the fish fillets, and leave in the fridge for about two hours. This will start the curing process. After two hours, remove from fridge and wash gently. Pat the fish dry. You can do this while the fish is in the fridge. Add all the ingredients together in a pan and bring to the boil. As soon as the vinegar boils, take off the heat and allow to cool. Occasionally stir the mixture to ensure the sugar dissolves. 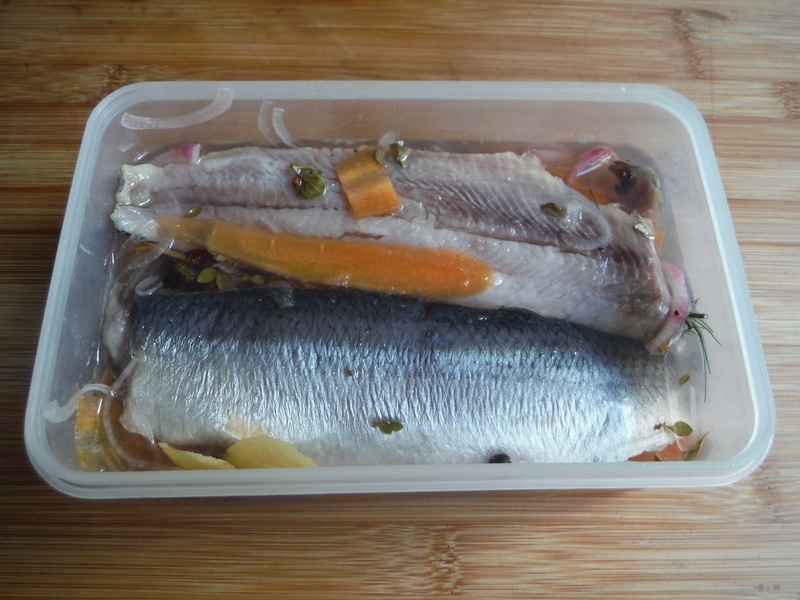 Place the fish, pickling liquid and solid ingredients together in a tupperware box for at least a day. The fish will be most delicious after at least five days in the liquid: earlier than that and the juniper and citrus rind tend to give a bitter or metallic edge. Basically, eat this how you like. Soused herring can be a snack, a starter, or part of a large meal like a salad. (The carrot and onion are also edible by the way.) The soused herring tastes great with lettuce, waxy potatoes, bread or something a little sweeter like beetroot or roasted squash. The principles of this method are much more important than the exact ingredients or quantities. Feel free to add or subtract sugar to your taste, for instance. The specific vinegar doesn’t matter, as long as it is relatively mild and clean in its taste. Use whatever herbs you think will work – dill is a North European classic with fish, so I tend to go for that, but others will do just as well. The citrus rind is a matter of taste. Personally I find orange rind a little overpowering in flavour, but lemon is just right. Finally, the juniper. While you can do without this, I do think it’s worthwhile adding to the mix. It’s flavour is important in the Anglo-Dutch culinary tradition from which this dish stems. It brings an aromatic, woodsy backnote to the flavour of the fish which I wouldn’t be without. 投稿日: 8月 31, 2015 10月 5, 2015 投稿者: charlesbodsworthカテゴリー: おつまみタグ: ニシン、ピクルス、魚.